Every year I dream of making these amazing and awe-inspiring decorated Easter eggs, and every year something happens (like last year when we didn’t even color the eggs that I’d boiled because we forgot about them) that prohibits the artistic mode and we just don’t find that creative flow. Notice those ‘No Spill’ egg dyeing doohickeys? Not so much ‘no spill’ – just so you know. They spill. And are a royal pain fishing the eggs back out of them, resulting in multicolored mama fingertips. I’m just sayin’. 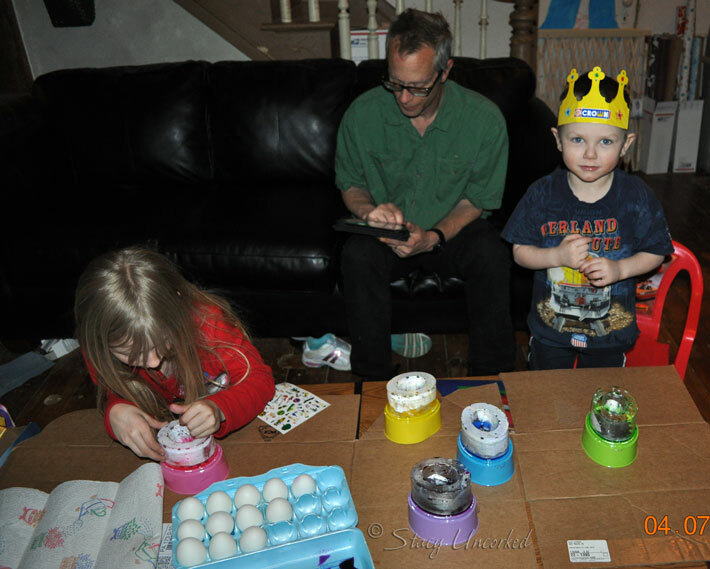 While we didn’t get creative or artistic (or creatively artistic), and I neglected to get a final picture of the completely finished eggs, at the end of the day everyone had fun and it was quality time well spent as a family. 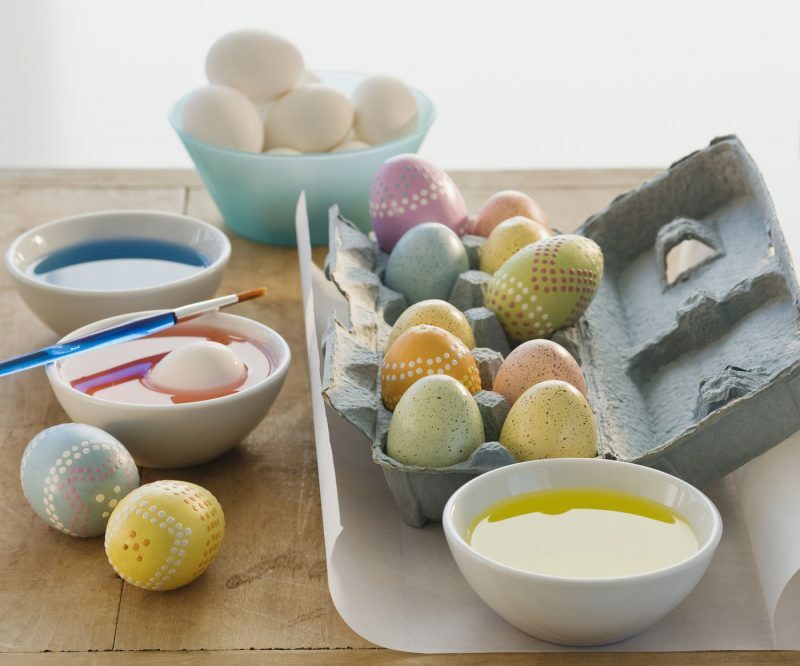 Do you color Easter eggs as a family (or at all)? 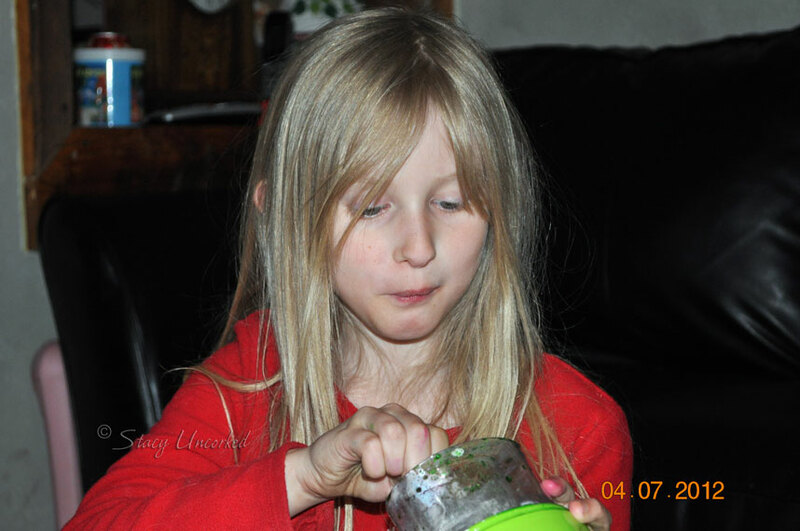 This entry was posted in Wordful Wednesday, Wordless Wednesday and tagged decorated easter eggs, easter egg, egg dyeing, family time, linky, quality time, Wednesday Hops, Wordful Wednesday, Wordless Wednesday by Stacy (the Random Cool Chick). Bookmark the permalink. No didn’t color eggs or even boil them. No kiddos here!! Ha! Love the photos…you can tell that everyone was having a good time. Sadly not – as kids when we were staying with friends in Greece we’d dye hard-boiled eggs red for the Greek Easter. These days I just eat the chocolate variety! No egg coloring for my family. But, we did celebrate the Feast of Peeps, and it was just the sweetest time! I’m such a bad housekeeper I didn’t even want to do eggs. I ended up doing them with my neighbour at her house. I just don’t have the patience for the mess and the whining when it’s not right. Completely forgot this year – and btw, yours are awesome! Lovely pictures! You’ve definitely enjoyed it! Looks fun though 0 and you saw ours – just fun. Have you tried drawing with a white wax caryon and then colouring? Works so well. Sweet….that part of Easter always brings the ‘kid’ out in me. I still love to color eggs. 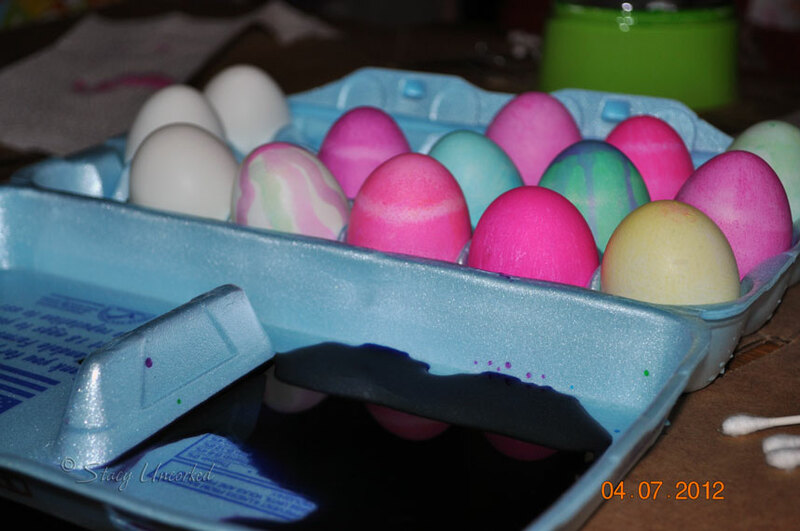 We tried the very simple sounding silk tie dying for some eggs on Easter eve. Not as vibrant as the ones online we saw. You can see our results on yesterday’s random. It sure looks like your artists had fun! So much fun! We did that to and it wasn’t perfect. It was still fun! My boys and I colored Easter eggs. It looks like your family had fun doing it and made beautiful eggs. 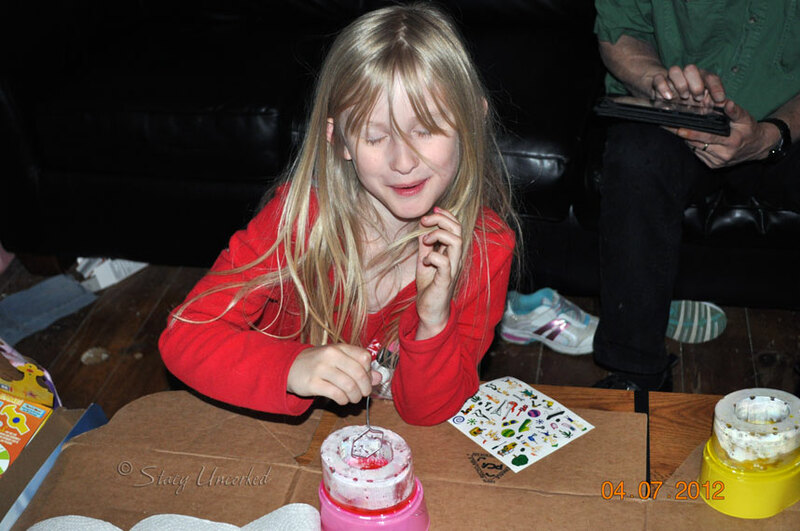 You got more creative than *I* did – I just dumped the darn things in the dye and walked away. Fished them out, dumped more in, walked away. Now, having said that, they were brown eggs which made the final products a lovely, earthy tone. We haven’t painted eggs in a couple of years. Fun memories though. My Easter egg ambitions are often trumped by reality too. I can’t imagine my 3yo sitting still enough for perfection. I’m lucky we have any dyed eggs at all! Maybe someday huh? the smiles on the faces say it all. Such fun memories. I skipped the eggs this year because of the mess and the fact that nobody ever eats them afterwards! I hate that… and if I peel them and make egg salad or something they complain because it’s funny colored. I would love to make the pretty, perfect eggs someday though! Such a nice tradition. The smiles on the children’s faces say it all. Nice job! You must have the patience of Job! I don’t even attempt anything like this. They turned out great imo. same here. I dream of beautiful easter eggs and in stead tend to end up with BLAH eggs. Oh well. It’s fun and that’s all the kids care about. You’re brave! 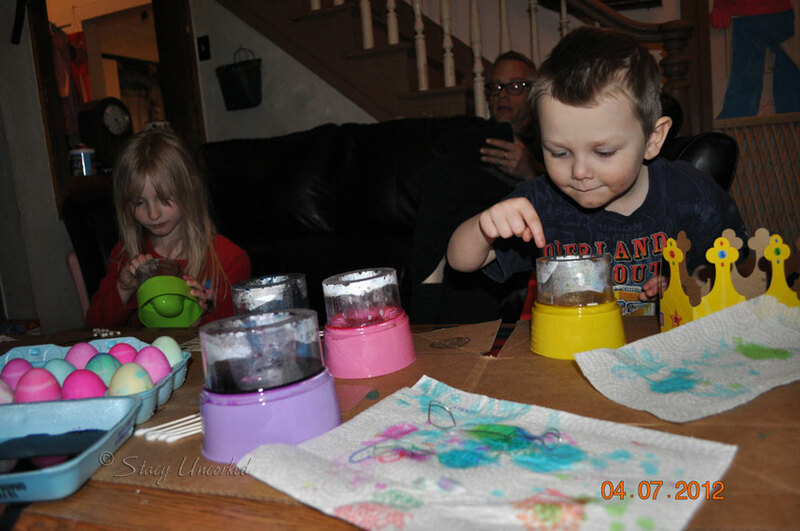 I “delegated” egg dyeing to Nana and Grandma! You all did great! Is there really any such thing as a no spill dye? We don’t do fancy eggs either, but this year the kids got very creative with their eggs. My oldest daughter used two colors on her eggs. I’ll share the photos next week. yep, family time is the most important thing. Pretty eggs are in the eye of the beholder. LOL about the yellow egg and Angry Birds. 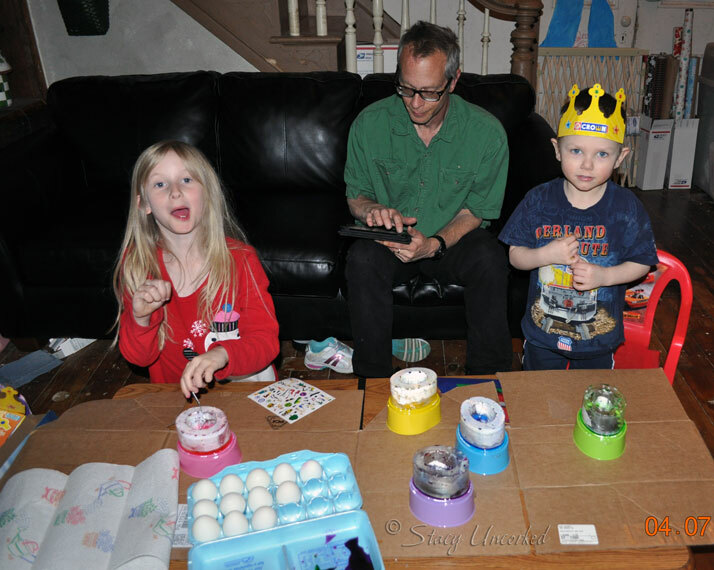 We had a lot of fun dyeing eggs on Good Friday. Thanks to Grammy, we did dye eggs. And what was different for me, they actually eat them the next morning (after being refrigerated all night). 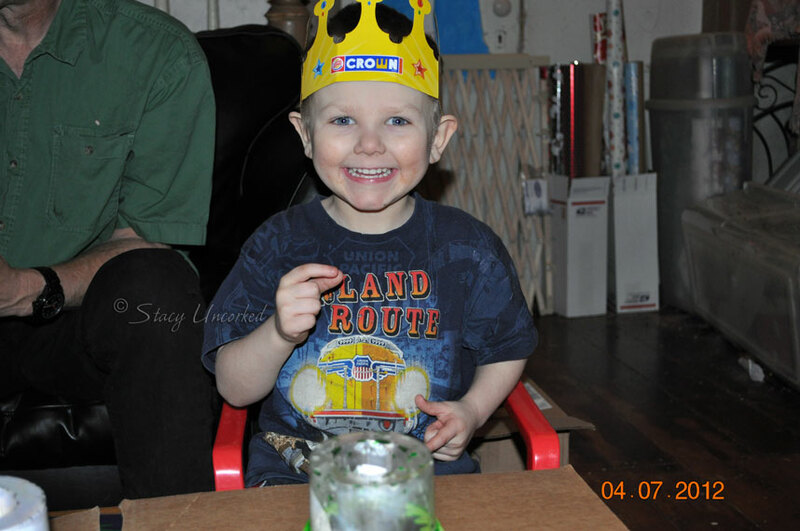 I love the crown on the little guy. Ah, isn’t that often the way with family activities. Never quite turns out like you planned, and is inevitably messier, but it is always quality family time. We didn’t dye eggs this year. We went out of town to visit family. I have to admit that I’m not broken-hearted about not dying eggs though. I think yours turned out GREAT!!! Decorate the house and yard where you’re holding the party with lots of pastel-colored helium balloons, streamers, and paper cutouts of eggs, rabbits, and carrots. I always love coloring eggs until I color eggs. Then I remember that I actually hate it. Ha! Thank you for linking up with me! We also did that thing with my family, after doing some colorful eggs we hid it and let the children find it since we put it some reward whoever found the hidden eggs! It’s a good time to spend Easter with your love ones. I love that your husband is in the background playing Angry Birds too funny! My husband loves that game as well. It seems that all of you are having so much fun with your easter eggs. Painting easter eggs are fun! Thanks for sharing! nice post n picture.still post dude. Bummer! I didn’t know you had a #WW linky. Next time! So…I see a lot of pink eggs in there…how did the Angry Bird egg come out?